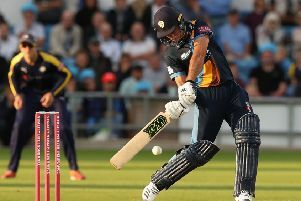 Matt Fisher boosted Yorkshire’s Royal London One-Day Cup hopes as the Vikings beat Derbyshire Falcons by two wickets with a ball to spare in a dramatic North Group game at Derby. Fisher blasted an unbeaten 24 from eight balls to chase down a target of 190 in a game reduced by rain to 24 overs a side despite Ravi Rampaul’s best limited overs figures of 5 for 48. Ben Slater made an unbeaten 109 from 82 balls in Derbyshire’s 189 for 6 with David Willey taking 4 for 47 but Tom Kohler-Cadmore replied with 81 off 63 balls before Fisher won it with consecutive fours off Hardus Viljoen. Yorkshire brought in Willey who only arrived back in England from India on Monday night but his first over went for 21 as Derbyshire got off to a flier. The first five over powerplay cost 52 runs with Slater hooking Matthew Fisher for six to punish Yorkshire who bowled too short and wide but the introduction of Adil Rashid restored some order with Billy Godleman well caught at deep midwicket as only 20 came from the next four overs. Rashid should have had a second but Adam Lyth put down Wayne Madsen on eight at long off and the batsman celebrated by reverse sweeping the final ball of the 11th over for six. Tim Bresnan removed Madsen for 20 when he miscued a pull at Tim Bresnan but after reaching 50 from 39 balls, Slater hit Liam Plunkett for three fours in the 16th over to get Derbyshire back on track. But some momentum was lost when Luis Reece collapsed in pain with an ankle injury and retired hurt at the end of the 18th over and Willey returned to bowl Gary Wilson and have Matt Critchley caught behind first ball. Willey struck again when Alex Hughes pulled to deep midwicket but Slater completed an excellent hundred off 77 balls before hitting two more fours in the final over. Derbyshire opened with Madsen’s off-spin and he responded with a maiden but Adam Lyth pulled Duanne Olivier for consecutive sixes before Kohler-Cadmore did the same in Madsen’s next over. Kohler-Cadmore drove Rampaul for six but Lyth skied the seamer high to mid on and in the next over, Willey top edged Olivier to short midwicket. Derbyshire struck a big blow in the 9th over when their former batsman Cheteshwar Pujara was lbw trying to work Critchley to midwicket and Ballance should have been caught on 11 by the substitute fielder at deep cover. It threatened to prove costly but Ballance was bowled by Olivier for 27 trying to ramp Olivier to fine leg in the 18th over and Bresnan was caught behind off Rampaul in the next over. Rampaul pinned Tattersall lbw to leave Yorkshire needing 55 off the last five overs and although Kohler-Cadmore swung the West Indian to wide midwicket, Fisher’s late assault saw the Vikings home in the gloom.